You know how we plan things and also plan on them going the way we want them to? LOL That truly doesn't seem to happen around here. 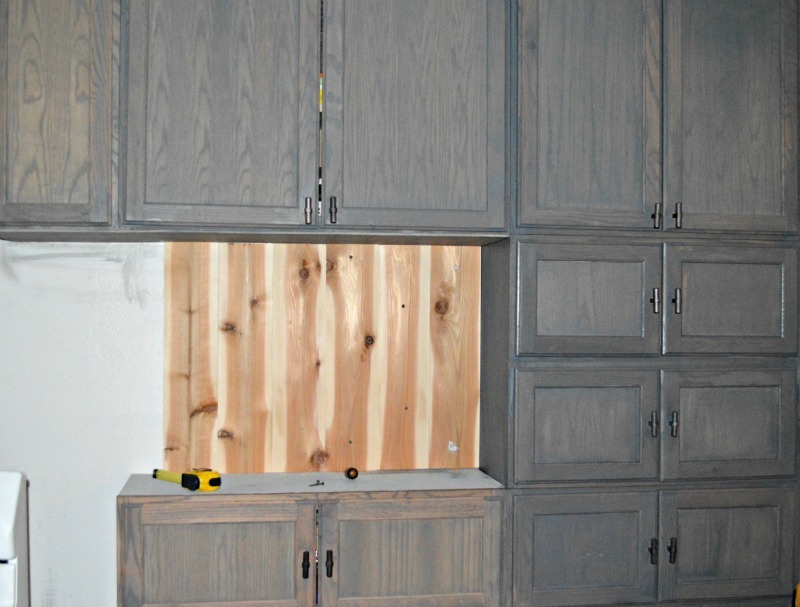 We're getting most things done, but I'm not accustomed to moving things down the list every single day. MONDAY - Grout entryway, Paint walls in refrigerator alcove, Set tiles for under refrigerator so we can get it moved out of the living room, Texture kitchen wall and get it painted, Paint bathroom walls with gripper paint to get it ready for texturing, Finish sorting through kitchen utensils and organize 1-2 cabinets. 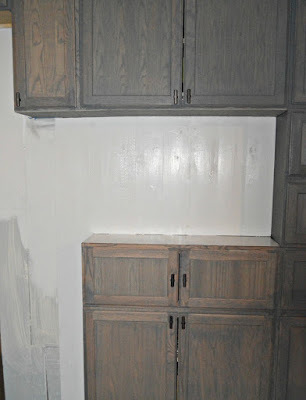 I really wanted a simple farmhouse look so we changed out minds on what we will be doing on the kitchen walls (simple rough hewn cedar planking painted) and it will be so much easier, but required a trip to Home Depot and extra paint. It doesn't look like much here, but I promise it will look great soon. TUESDAY - Get blood drawn, Walmart and grocery store. Work on kitchen wall. Make BBQ sauce for the baby back ribs and start Baked Beans. WEDNESDAY - Grout entryway,. Set tiles for under refrigerator so we can get it moved out of the living room, Finish the kitchen wall and the migration of "things". Finish sorting through kitchen utensils and bakeware. I LOVE to cook. It's just that plain an simple. I also believe one of the best things I can do for my family is to make things from scratch. I'm a HUGE believer that just because we can, doesn't mean that we should as in buying a canned product versus making it from scratch. Our son will be here for one night only and then my uncle will be here the next night. Both nights are weekend nights so we're eating in to avoid crowds and noise. When we asked what our son wanted to eat he very definitely said BBQ! So today I began my homemade BBQ sauce and Old Fashioned Boston baked beans ala Texas. Both taste better if they have a few days to let the flavors meld together. Dice salt pork and layer on bottom of slow cooker. Chop onion and scatter over salt pork pieces. 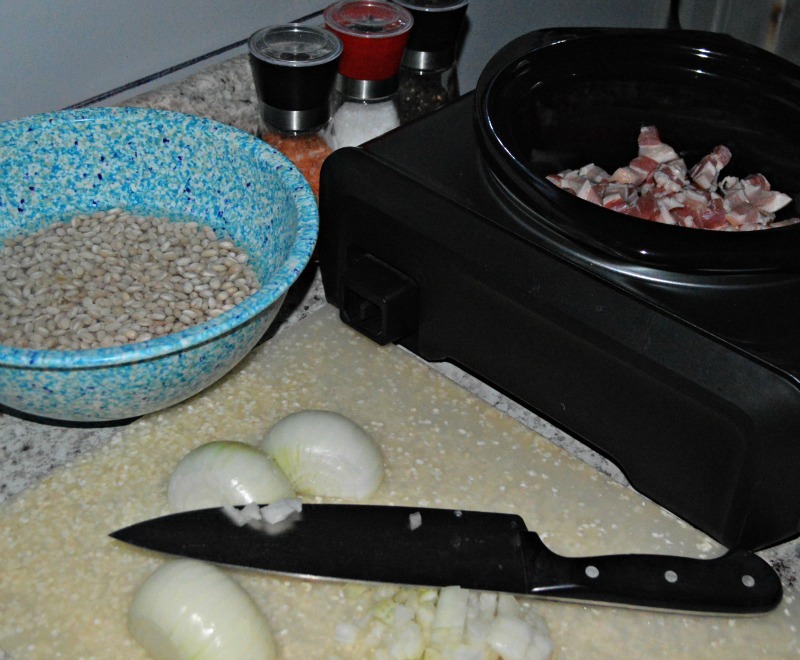 Place beans in slow cooker on top of salt pork. Cover with 5 cups water. Return beans to slow cooker. Add vinegar, ketchup, brown sugar, maple syrup and molasses and blend well. Add in 1/2 cup of bean water as desired for consistency. Heat through for an hour or so.